The east side of Main Street, looking toward the corner of Court Street in Springfield, around 1938-1939. Image courtesy of the Springfield Preservation Trust. The first photo shows a group of four buildings along the east side of Main Street, representing a wide range of late 19th and early 20th century architectural styles. On the left side is the ornate Beaux Arts-style Union Trust Company building, which was completed in 1907. 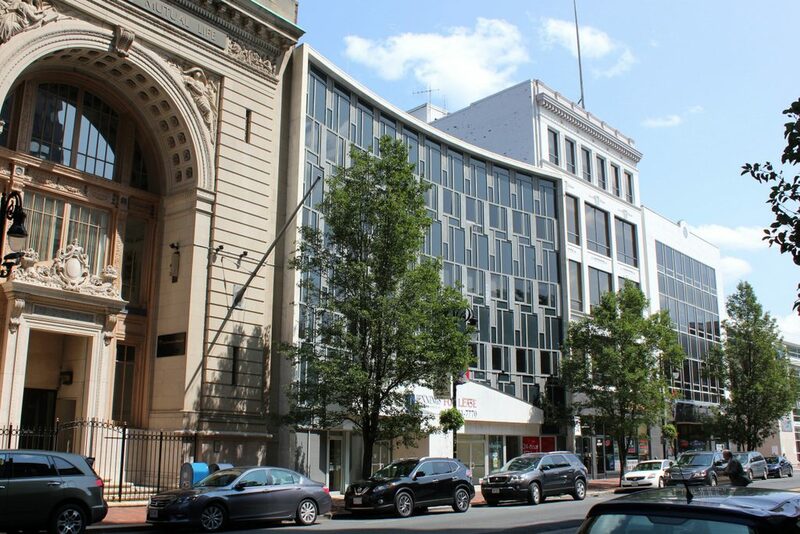 It was designed by the noted architectural firm of prominent Boston-based architectural firm of Peabody & Stearns, and housed the Union Trust Company. This company was formed by the 1906 merger of three city banks, and it still occupied the building when the first photo was taken in the late 1930s. 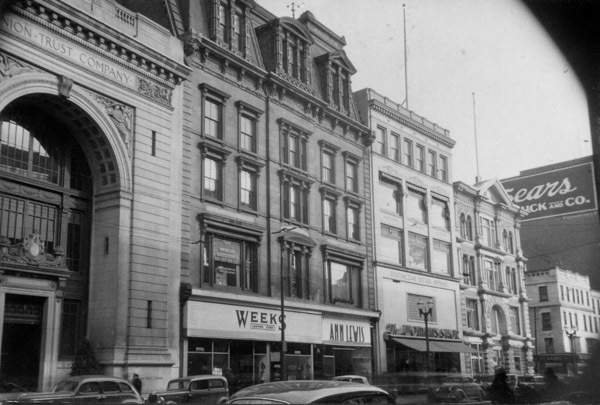 Just to the right of the Union Trust Company, in the center of the first photo, is a five-story Second Empire-style building that once housed the Massachusetts Mutual Life Insurance Company. The company was originally located in the Foot Block, at the corner of Main and State Streets, from 1851 to 1868, before moving into this building. However, its offices were only here for about five years before the building was gutted by a fire on February 5, 1873, although it was soon reconstructed based on plans by architect George Hathorne. The company would remain here until 1908, when a new, larger office building was completed a block south of here, where the Foot Block had previously stood. The third building to the right was probably built sometime in the early 20th century, based on its architectural style. By the time the first photo was taken, the ground floor of this five-story building housed the Woman’s Shop, which offered “Distinctive Outer Apparel,” according to the sign above the entrance. To the right of it, at the corner of East Court Street (now Bruce Landon Way), is the Springfield Five Cents Savings Bank. It was built in 1876, and featured an ornate Main Street facade, including cast iron columns. A better view of the exterior can be seen in an earlier post, which shows the view of this scene from the opposite direction. Today, almost 80 years after the first photo was taken, most of the buildings are still standing. The former Woman’s Shop building has remained relatively unaltered except for the exterior of the second floor, and the Union Trust Company building is now listed on the National Register of Historic Places because of its architectural significance. Even the Five Cents Savings Bank building is still there in the distance, although it is hard to tell from this angle. The Main Street facade was rebuilt in the mid-20th century, but the building itself remains standing, with the original southern facade visible along Bruce Landon Way. Overall, the only building from the first photo that is completely gone is the former MassMutual headquarters, which was demolished sometime around the 1950s and replaced with the current Modernist building. 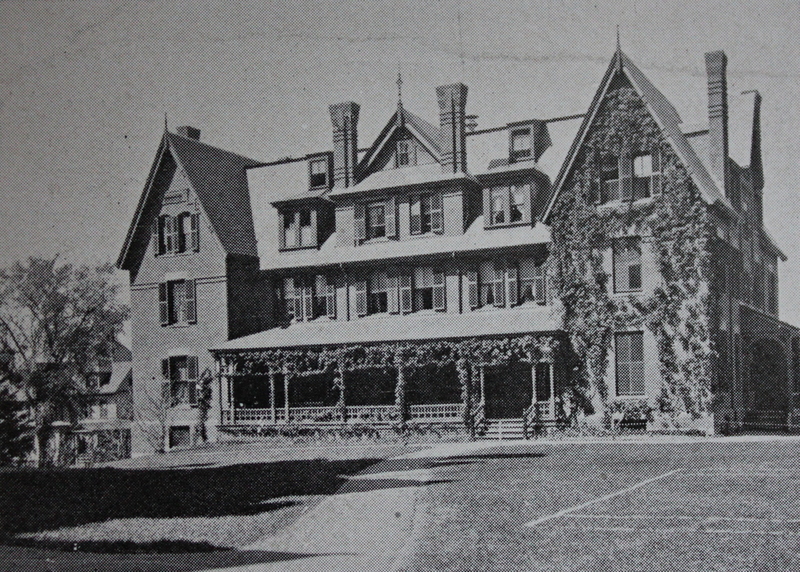 Hubbard House on the campus of Smith College in Northampton, around 1894. Image from Northampton: The Meadow City (1894). Washburn House was built in 1879-1880, and is among the oldest buildings on the Smith College campus. It was opened as a dormitory just a few years after the school opened, and was named for trustee and school treasurer George W. Hubbard. Like many of the other 19th century buildings on the campus, it was designed by the Boston-based architectural firm of Peabody and Stearns, with a High Victorian Gothic style that matched the rest of the campus. Today, more than 120 years after the first photo was taken, the exterior of Hubbard House has not seen any significant changes from this angle. The building was renovated in the early 1990s, and was expanded on the back side with an enlarged dining room, but overall it has remained well-preserved. 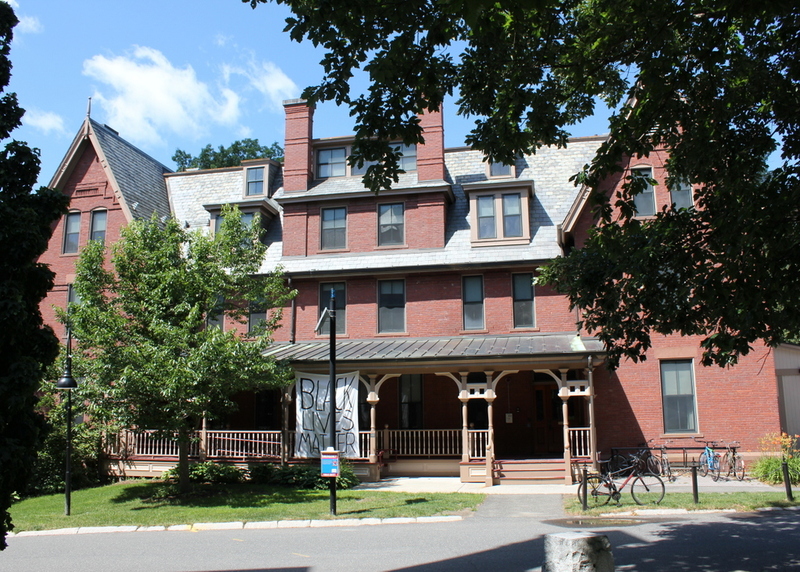 It continues to be used as a dormitory, now housing 53 students on three floors, and today it is one of 35 residential buildings on the Smith College campus. 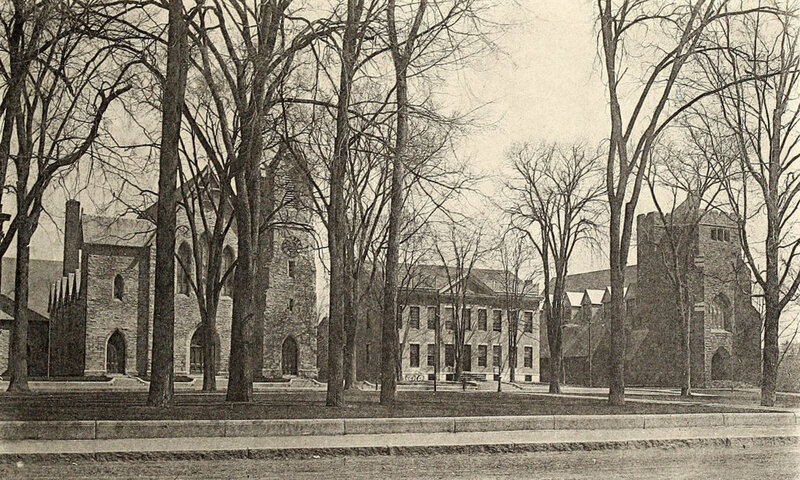 College Hall on the campus of Smith College, seen from West Street in Northampton, around 1900. Image courtesy of the Library of Congress, Detroit Publishing Company Collection. Smith College was established in 1871, as part of the will of Sophia Smith (1796-1870), who left a large bequest to establish a women’s college in Northampton. This building, College Hall, was the first building on the campus, and it was completed in 1875, the same year that the school opened. It was designed by Peabody and Stearns, a prominent Boston-based architectural firm, and its design reflected the High Victorian Gothic style that was fashionable at the time. 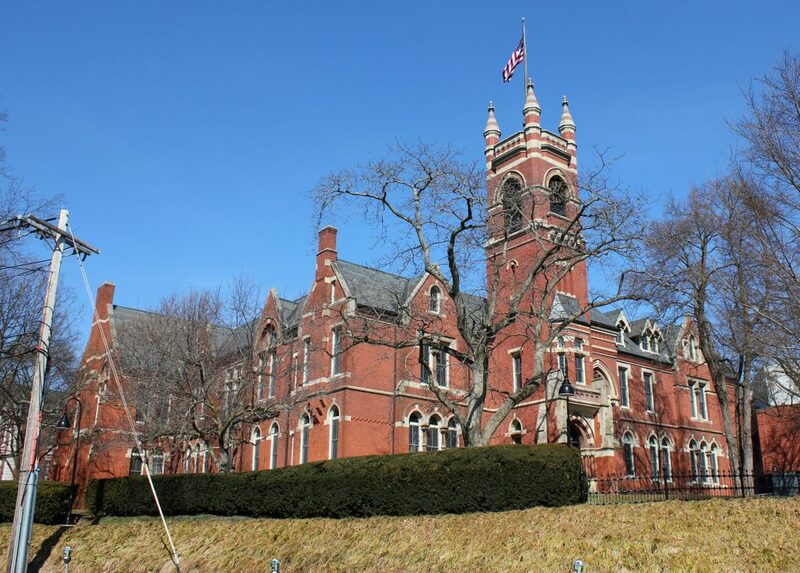 Smith College has just 14 students and six faculty members when it opened in the fall of 1875, and this building was used for almost everything except dormitory space. When completed, it included classrooms, a laboratory, a social hall, an art gallery, and administrative offices, although this soon began to change as the college grew. By the time the first photo was taken at the turn of the 20th century, the college’s enrollment had increased significantly. The campus had grown accordingly, and included new residential buildings, a gymnasium, a music hall, an art gallery building, a science building, a chemistry building, and a new academic building. College Hall itself had also been expanded, with an 1890 addition that increased the capacity of the social hall – renamed Assembly Hall – from 500 to 900. In 1901, Assembly Hall was expanded again, by opening up the second floor above the hall and adding another 500 seats. However, this ended up being a temporary change. John M. Greene Hall, with its 2,225-seat auditorium, was completed in 1910, eliminating the need for such a large auditorium here in College Hall, and the second floor above Assembly Hall was subsequently reconstructed. 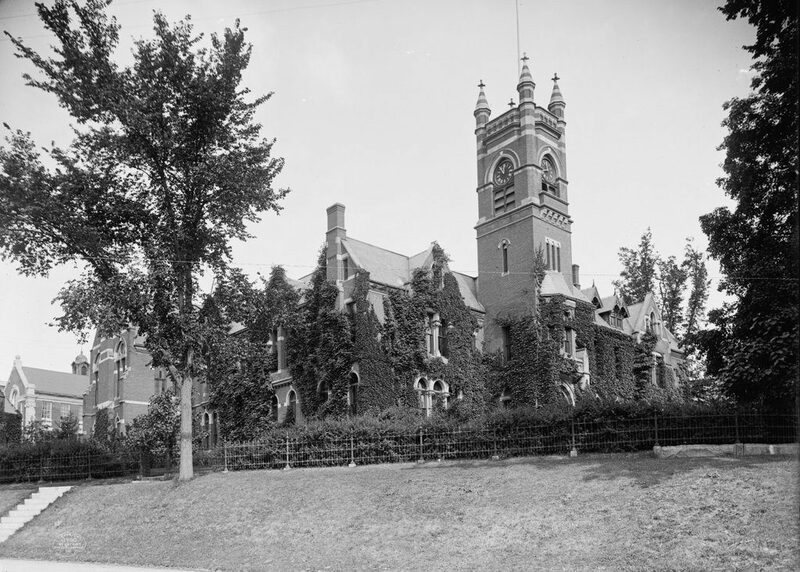 By the 1909-1910 school year, Smith College employed 104 faculty members and had 1,635 students, with an annual tuition that had just been increased from $100 to $150. At this point, College Hall was only used for the auditorium, some classrooms, and administrative offices, but over time this would continue to change as more buildings were added to the campus. College Hall would ultimately come to be used only for offices, resulting in significant changes to the interior in he process. However, the exterior appearance has remained well-preserved over 140 years after the building first opened, and today the only noticeable difference between these two photos is the lack of ivy on the brick walls of the building. 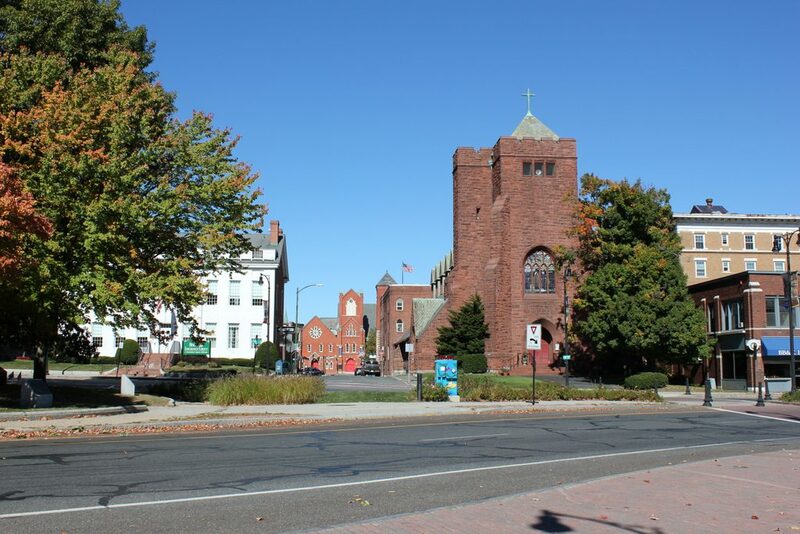 As seen in a previous post, St. Stephen’s Church is one of several historic 19th century buildings at Park Square, in the center of downtown Pittsfield. The Gothic Revival church was designed by Peabody and Stearns, a prominent Boston firm of the late 19th and early 20th centuries. Completed in 1890, it replaced an earlier Episcopalian church that had been built on virtually the same spot in 1832, the same year as the old town on the left side of the scene. The town hall has survived to the present, but the old church had to be demolished to build Allen Street, seen in the center of the photos. When the first photo was taken, St. Stephen’s Church was just a few years old. More than 120 years later, most of its surroundings, except for the old town hall, are different, but not much has changed with the church itself. The building underwent a restoration in 1999, which included repairs to the stained glass windows that had been designed by Louis Comfort Tiffany and Mary Elizabeth Tillinghast. The church is still in use as an active Episcopalian parish, and it is a contributing property in the Park Square Historic District on the National Register of Historic Places. 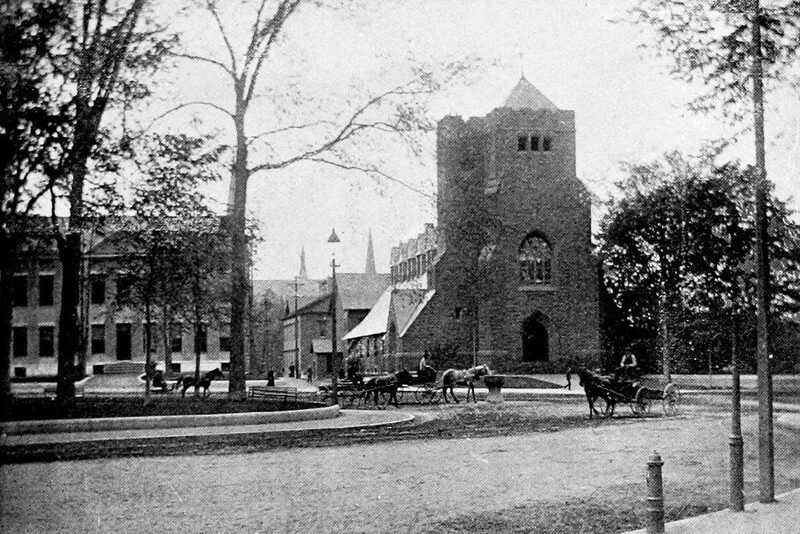 Facing north across Park Square in Pittsfield, around 1900. Image from Pittsfield, Massachusetts, and Vicinity (1900). It is hard to tell in the present-day photo because of the trees, but all three of these historic buildings on the north side of Park Square are still here today. 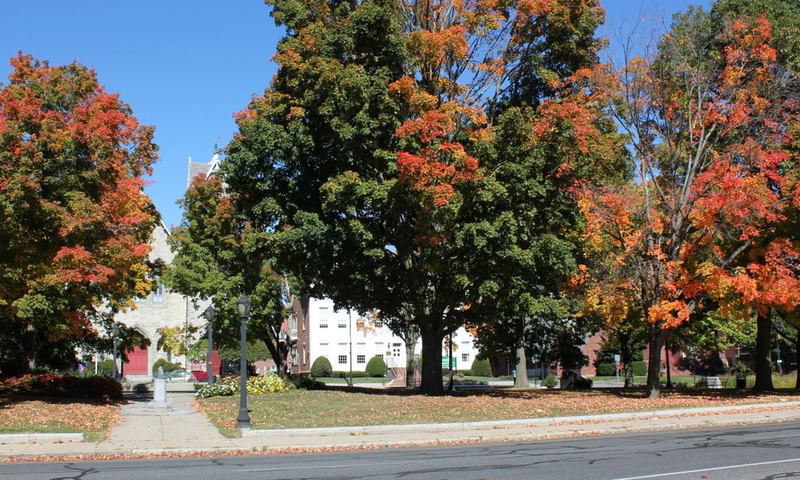 In the center is Pittsfield’s old town hall, a plain brick Federal-style building that was completed in 1832. After Pittsfield became a city in 1891, it remained in use as city hall until 1968, when the city government moved a few blocks away to the old post office. The old town hall is flanked on either side by stone Gothic Revival churches, both of which were designed by prominent architects. To the left is the First Church, which was designed by Leopold Eidlitz and built in 1853 on the site of an earlier 18th century church building. On the other side is St. Stephen’s Church, designed by the Boston firm of Peabody and Stearns. Although architecturally similar to the First Church, it is significantly newer, having been completed in 1889. Today, all three of these buildings are well-preserved and relatively unchanged from when the first photo was taken. The two churches are both still in active use, and the old town hall is now an office building for the Berkshire Insurance Group. In 1975, the buildings were added to the National Register of Historic Places as part of the Park Square Historic District. 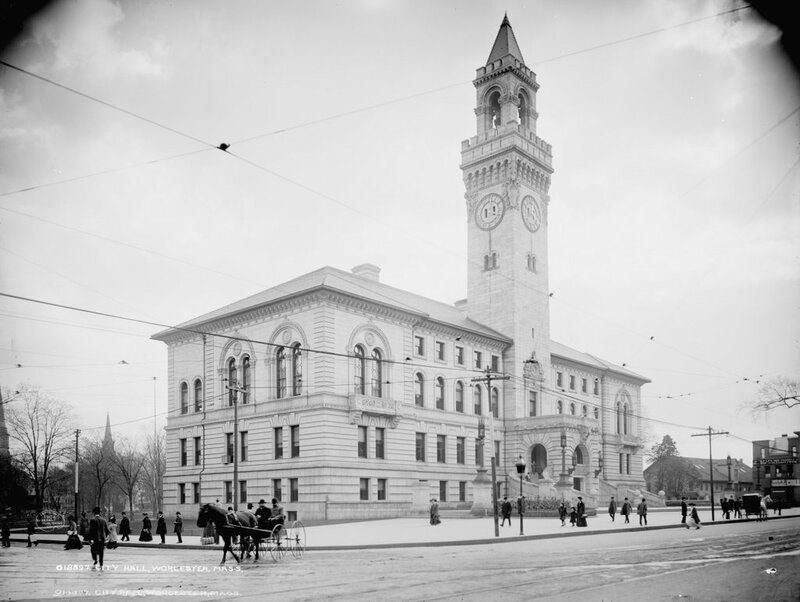 Worcester’s City Hall, seen from the corner of Main and Pleasant Streets, around 1906. Image courtesy of the Library of Congress, Detroit Publishing Company Collection. This site on the western end of the Common has been the center of Worcester’s government for many years. In colonial days, the meetinghouse was situated here, and in 1825, a plain Greek Revival style town hall was built here. 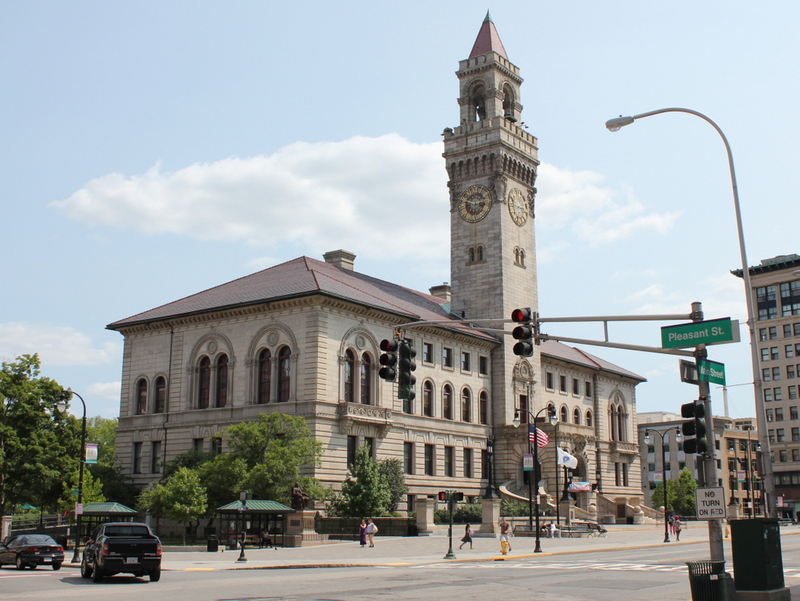 After Worcester became a city in 1848, this building served as City Hall for another 50 years, until it was finally replaced in 1898 by a much larger and more elaborate building on the same spot. Designed by the prominent Boston firm of Peabody & Stearns, it reflects the Renaissance Revival architecture that was gaining popularity in public buildings at the turn of the 20th century. City Hall bears some resemblance to the Boston Public Library, which had been completed several years earlier, but it also includes a 205-foot tower in the center of the Main Street facade. City Hall was not quite 10 years old when the first photo was taken, and not much has changed to its exterior appearance since then. Nearly 120 years after its completion, it remains the fourth tallest building in the city, and it remains in use as the seat of the city government. Along with the Worcester Common, the building is listed on the National Register of Historic Places.